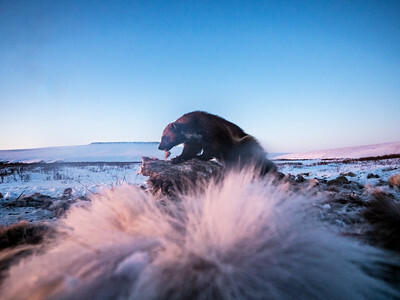 On Alaska's North Slope, biologists are studying wolverines and their relationship to snow, to understand how a changing Climate will affect the most elusive of predators. 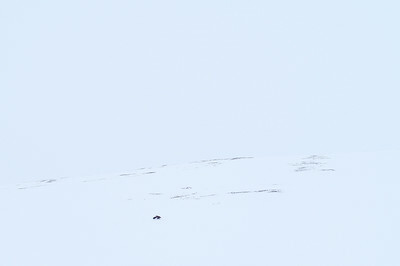 A wolverine disappears into whiteout conditions on the North Slope in Alaska's great wilderness. 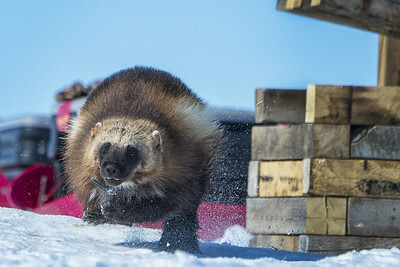 A small female wolverine is caught in one of the biologists live traps. 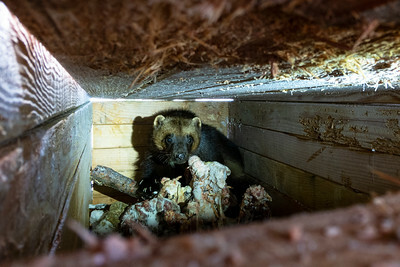 Once a wolverine is caught in a trap, biologists must arrive at the location within 8 hours, because the animals can chew through the 4 inch thick wood walls to escape. 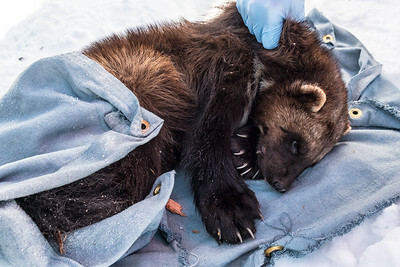 A small female wolverine is quickly weighed by biologist before being fitted with a satelite collar and released into the wild. 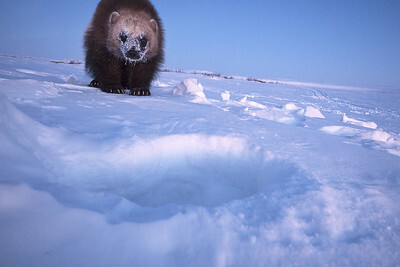 Biologists are looking to determine the importance of snow to wolverines on the North Slope. 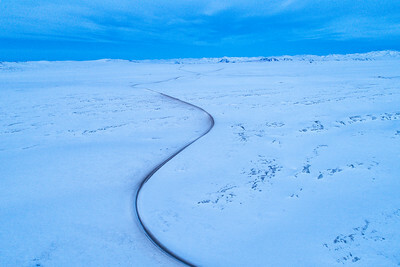 In a land with no trees, snow becomes necessary for denning, evading predators and storing food. 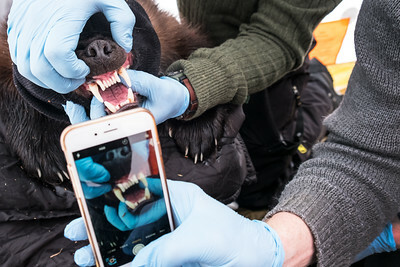 Wolverine biologist Tom Glass takes a picture of a wolverines teeth, to be used for identification and a health check, during the satelitte collaring process. A wolverines teeth and jaw have the power to crush the large bones of animals. This unique ability provides them with an opportunity to feed on the left overs of bear and wolf kills, two animals that don't eat the bones of their prey. 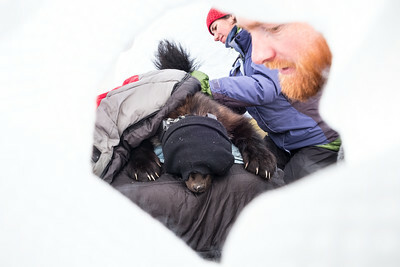 Wolverine biologists Tom Glass and Helen Chmura workign with a sedated wolverine. 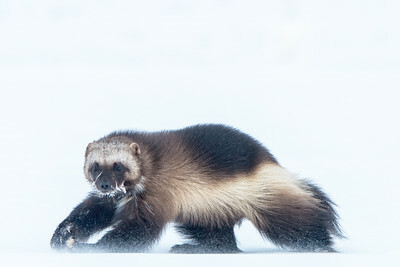 The wolverine is covered with warm blankets and a water bottle to regulate its' temperature during the 30 minute procdure to fit it with a satelite collar. A recently satelite collared wolverine is released from its' live trap while wolverine biologist Tom Glass looks on. 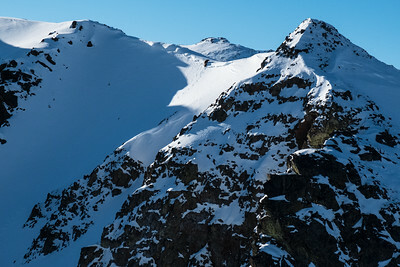 A wolverine tops out on a steep mountain. Wolverines seem to view the world as 2 dimensional. 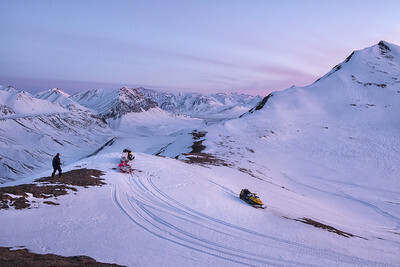 They climb steep mountains at the same pace they wander on flat lands and don't seem to take the easier path around mountains, choosing to simply go up and over. 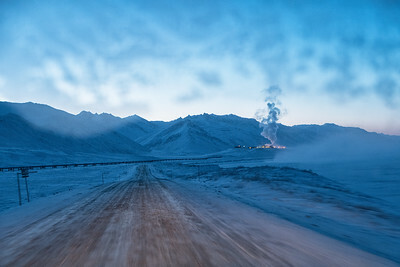 The Dalton Highway was pushed through the Brooks mountains and the North Slope in the 1970s, to support oil development in Prudhoe Bay and to enable to construction of the Alyeska Pipeline that stretches from the Arctic Ocean to Valdez, Alaska. 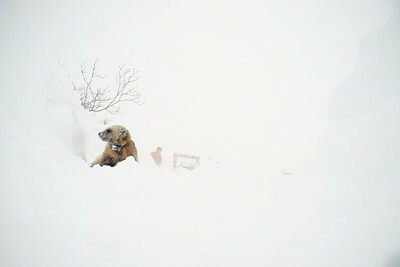 A collared wolverine is released from a live trap during a blizzard. 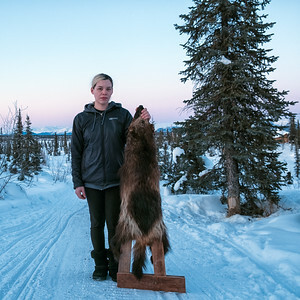 Young Gwich'in trapper, Brittany Hollandsworth of Arctic Village, poses with her prize wolverine pelt. 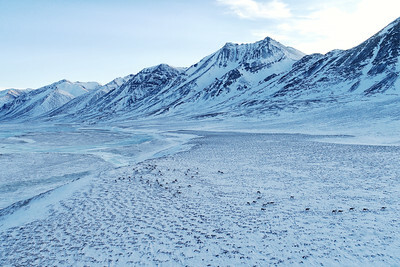 Wolverine trapping and hunting by indigenous and non-indegenous people is popular throughout the North Slope and Brooks Range. 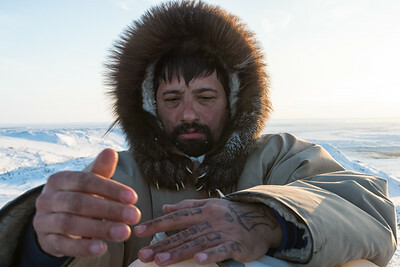 Inupiat hunter Quiyaan Harcharek of Utqiagvik, during a wolverine and wolf hunting trip on Alaska's North Slope. 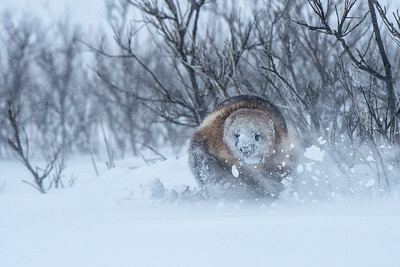 A wolverine ruff rims the outside of his parka. The wolverine ruff is the most desireable of all animal ruffs, because it wicks away moisture and is more durable than wolf skin ruff. 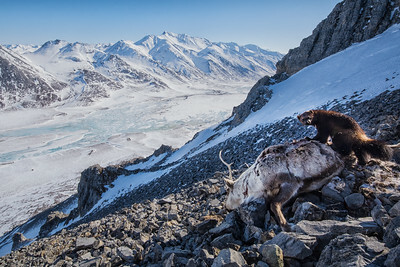 A wolverine chews on a caribou carcass, eyeing the horizon for competition. 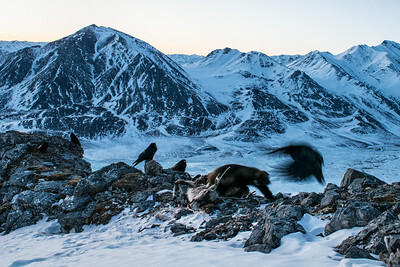 A collared wolverine chases off a raven to protect its caribou carcass. 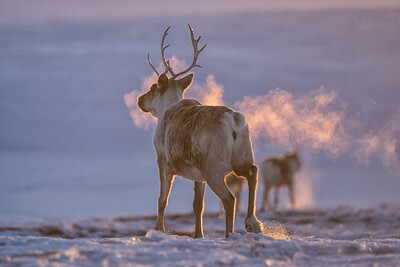 This caribou was killed by wolves in the Arctic National Wildlife Refuge.